From the team behind the best-selling 5 lb. Book of GRE Practice Problems comes a title designed for the millions of students prepping for the ACT. With over 1,800 practice problems written by expert instructors, thorough explanations, and one-of-a-kind progress trackers, the 5 lb. Book of ACT Practice Problems is the perfect resource for high school students everywhere. Manhattan Prep’s 5 lb. 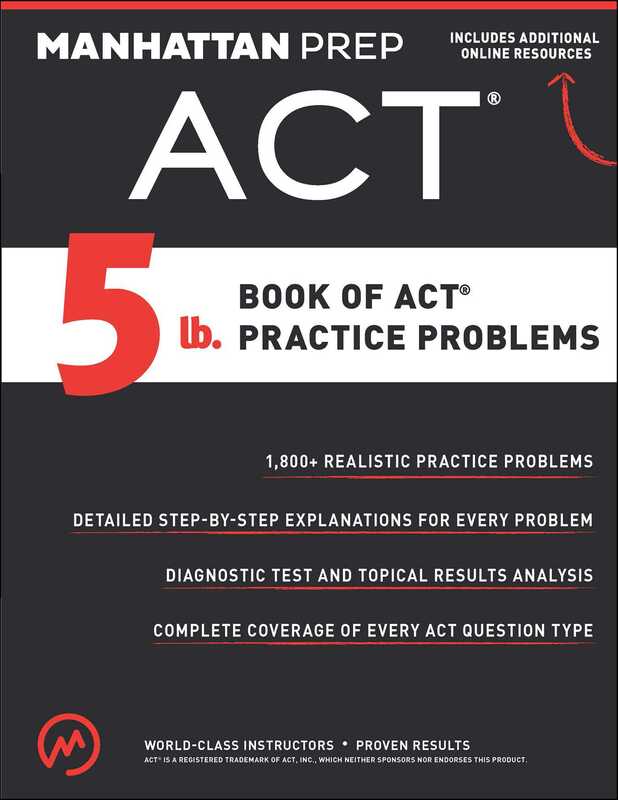 Book of ACT Practice Problems is an essential resource for any student taking the ACT. Packed with over 1,800 practice problems covering all topics tested on the exam, this book helps students build fundamental skills through targeted practice. Developed by our expert instructors, the problems in this book are sensibly grouped into practice sets and mirror those found on the actual ACT in content, form, and style. Covering every topic within English, Math, Reading, Science, and Writing, the problems are accompanied by thorough explanations and provide in-depth guidance to students for review. In addition, progress trackers and topical grading sheets enable students to stay motivated and zero in on weaknesses. This fully up-to-date guide reflects both recent and upcoming enhancements to the ACT. Purchase of this book includes access to additional online resources.